Comet 211673A. Actuator Plate for Comet Brake Assembly (218070A). Sold as Package of ONE. 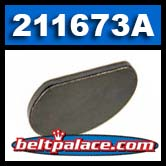 Murray Disc Brake Assembly (680287) Actuator Plate.